A Czech Lego store has started selling a new Star Wars minifigure, inadvertently revealing a really weird character choice for Lego's next Star Wars polybag. Yes, Darth Revan - the powerful Sith Lord from Bioware's smash hit RPG Knights of the Old Republic - will be getting Legoised. It's a bizarre move for Lego, considering that while Darth Revan is a fan favourite character amongst Star Wars gamers, he's still a very niche character to wider Star Wars fans and Lego fans alike. It's even weirder considering outside of a few sets based on characters and vehicles from Bioware's Star Wars MMO, The Old Republic, Lego haven't really turned to the universes of the Star Wars video games for their sets. But still, it's another cool Sith character to play with! 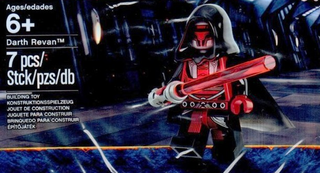 Whilst there's been no official word on when Darth Revan will make his way to the wider market, there's a good chance he's going to be the upcoming gift for Lego's yearly 'May the Fourth Be With You' Promotion, where online shoppers spending over a certain amount on Star Wars Lego are given a free Star Wars polybag.